15 Jun 2012 | Author: David J. We often hear that “a QR Code is just a QR Code.” While they may look the same, what happens behind the code can vary widely – and that is really where the magic happens. The value of QR Codes is vast, and one area that all marketers love is data – or business intelligence. Never before have marketers been able to get so much intelligence around how people interact in the real world from media like print ads, store displays, and even packaging. The amount of data you can get from a QR Code varies from the basics like number of total scans, up to location heat mapping and representative demographics. Some online code generators give you the basics, but there is a big catch – anyone can see it! This practice provides detailed intelligence to your competition, like which products or promotions are being scanned on which days, making it easier for others to learn from your success. 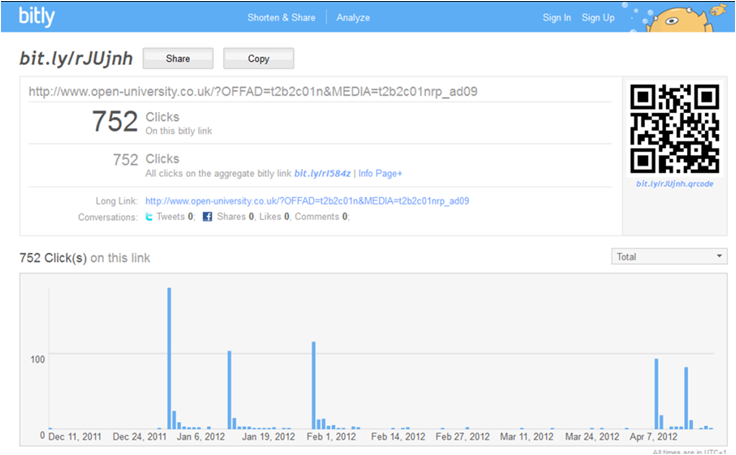 To illustrate, you can access the statistics of London’s Open University’s QR Code created on bit.ly: The statistics are simply accessed by going to bit.ly/rJUjnh+ in your web browser. Like everything else, it is critical to remember to read the fine print in the Terms & Conditions when evaluating QR code generators, and even more advanced solutions. Some platforms turn the data generated by your campaign into public domain knowledge, and others will take ownership of your data for monetization purposes. To find out more about risks of using free code generators, please download our whitepaper. One Response for "Your QR Code May Have Said Too Much"